ATCO Properties & Management announced today that a home goods provider will be joining the tenant roster at 373 Park Avenue South, a 12-story, boutique office building in the Flatiron District. Lifetime Brands, Inc., the designer and seller of branded kitchenware, tableware, and other products for use in the home, has signed a 8,732 s/f lease on a portion of the 3rd floor to serve as both an office and showroom for the company. The company is headquartered in Garden City, N.Y. Kate Goodman, co-president of ATCO Properties & Management, made the announcement. William Carr, managing director, represented the landlord in the 5-year leasing transaction. Scott Bennet and Todd J. Abrams of Prime Manhattan Realty represented the tenant. Asking rent was $56 per square foot. Constructed in 1910, major tenants at 373 Park include flexible office provider Knotel; private membership work collective NeueHouse; and recruiting organization Advanced Focus. Choyce Peterson announced the completion of lease negotiations for Riker Danzig Scherer Hyland & Perretti LLP for a new Westchester office at 399 Knollwood Road, in White Plains. Amy Lerner, Executive Vice President, represented Riker Danzig. Six professionals will work in the new office of over 1,800 s/f. Lerner was able to secure a competitive market rent, free rent, and high-end finishes in the entrance and flooring in the reception area. Jamie Schwartz of GHP Office was the representative for the landlord, SKA Equities, LLC. Koeppel Rosen has leased the entire second floor of the Rosen family’s NoMad office building at 443 Park Avenue South to flexible workspace provider, Knotel. 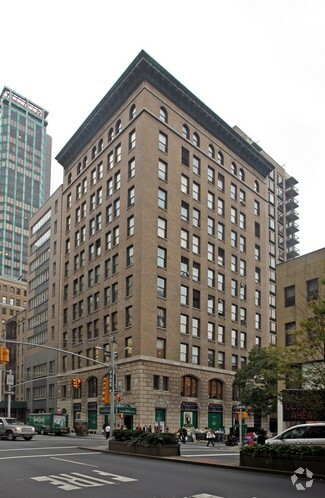 David Koeppel and Max Koeppel of Koeppel Rosen LLC, the leasing and managing agent for the Rosen family’s Midtown South portfolio, represented the landlord in the 10-year lease for 7,629 s/f of office space. Elie Reiss of Skylight Leasing represented the tenant. The creative loft space features high ceilings, hardwood floors and open layout. Koeppel Rosen recently undertook a full lobby renovation at 443 Park Avenue South. Totaling 82,500 s/f, the 11-story building is 95 percent occupied by a roster of tenants that includes strategic branding agency TAG CREATIVE LLC, Lawlor Media Group and the architectural firm, David Smotrich & Partners. According to Max Koeppel, there are currently three available spaces in the property. KZA Realty Group closed three commercial leases in the Bronx. • A former Radio Shack location at 3587 East Tremont Avenue includes a parking lot with room for 10 cars that will be shared with the neighboring Bruckner Hobbies store. Owner Gianmarie Realty signed a 10-year lease for the 2,056 s/f space with Lam Mark Trading of Flushing, Queens. Kathy Zamechansky represented both parties. • Green Earth Apothecary, a health food store, is coming to 153 Dreiser Loop. The five-year lease on the 1,161 s/f space includes a five-year renewal option. Kathy Zamechansky represented the owner, Riverbay Corp. Sherry Scanlon and Zamechansky at KZA Realty represented the lessee, Bridget Bonaparte, a resident of Co-op City. • At 469 East 147th Street (also known as 493 Brook Avenue), BX Properties Realty and Blue Sky Development Partners signed five-year lease with a one year renewable option for the 700 s/f space located in a new affordable housing complex. Zamechansky represented the buyer and the lessee, also represented by Sherry Scanlon at KZA Realty. Nuxeo, a cloud-native Content Services Platform, today announced the opening of its new North American headquarters in New York. Nuxeo has signed a lease for a new corporate office space at 45 Main Street in DUMBO The 45 Main Street building, managed by Two Trees Management, includes a 9,500 s/f rooftop, a tenant-only amenity that offers a multi-purpose room along with integrated benches and movable furniture to accommodate work gatherings. Jed Walentas, Principal of Two Trees Management announced the lease. The Savitt Partners team of Elliot Zelinger and Greg Lafayette, brokered a lease for Vector Media Group, a growing interactive media agencies, for 8,264 s/f of office space at 99 Madison Avenue. Owned by the Kiamie family and managed by Windsor Management Corp., the NoMad office property is now 100 percent occupied and has an asking rent of $69 psf. Vector Media Group will be relocating its New York City headquarters to the entire 10th floor at 99 Madison Avenue. The ownership has committed to building out the office space to the firm’s specification, with a move in date of March 2019. Angel Commercial announced the following transactions in office, retail, and industrial. • Dr. Patrick Fratellone has leased 2,160 s/f of medical office space at 1817 Black Rock Turnpike in Fairfield, CT. Angel Commercial represented the landlord, ­1817 Black Rock Turnpike, LLC, in this transaction. Dr. Fratellone is a New York City-based cardiologist who is expanding his practice, Fratellone Medical Associates, into the area. Jon Angel made the announcement. NIA National Realty has negotiated a lease renewal at 23 Bland Street, Emerson, a multi-tenant industrial-flex building. SGD, Inc. a specialty gas equipment and supply distributor has renewed its lease for 5,173 s/f of space. Vice President Nina Bianco represented both the tenant and the landlord, a long-term Bergen County property owner. The building offers office space, a loading dock, drive-in doors, light industrial, and warehouse space. Jeffrey L. Heller, Principal and Managing Director of Avison Young’s New Jersey offices, announced the closing of five separate office leases on behalf of ownership, Highstone Equity Group, at 500 North Franklin Turnpike in Ramsey, NJ, representing over 11,600 in aggregate square feet at the property. An Avison Young team comprising of Marc S Krieger, senior vice president with the assistance of Steven Geltzeiler, senior vice president, represented building owner, Highstone Equity Group, in the transactions. The five new leases include Mountainside Treatment Center, Opulence Funding, Senior Solutions Group, The Marchese Group and WWEX. • In its role as Dollar Tree’s exclusive real estate representative statewide, Danielle Brunelli brokered the lease of a 9,000 s/f endcap unit at The Marketplace, located at Route 34 and Disbrow Road in Matawan. Brunelli also served as exclusive leasing broker for the owners of the 55,000 s/f property. The firm also represented The Marketplace on a lease for Action Uniform Company, which opened its fourth New Jersey store in a 3,000 s/f inline space. • Dollar Tree expects to open in March 2019 in a 13,717 s/f inline space at Tano Mall, located at Amboy and Pierson Avenues in Edison. Dollar Tree will occupy a space that previously housed a Rite Aid drugstore at the 115,000-s/f center. The lease was brokered by Danielle Brunelli. • In Monmouth County, Brunelli represented the landlord on a lease for 12,816 s/f Goodwill Industries store and donation center at Navesink Center on Route 36 in Middletown. Expected to open in February 2019, the store will occupy the balance of the property’s former A&P supermarket, adjoining the recently opened 10,920 s/f Dollar Tree signed by Brunelli earlier this year. R.J. Brunelli serves as exclusive broker for the 43,200 s/f center, which is also undergoing a façade renovation. • Senior Sales Associate John Lenaz completed two leases for Main Street Shopping Center, a new 13,800 s/f property at Main Street and Old Stage Road in East Brunswick. March 2019 openings are planned for a Ten Dimes dollar store in 1,460 s/f and HairSpace, a full-service salon that will occupy 1,407 s/f. R.J. Brunelli serves as exclusive leasing representative for the Middlesex County property, which is anchored by 7-Eleven. Lenaz also represented the tenants on both leases.